Even in a room filled with people who regularly work with struggling families, Thursday’s informal Goodwill Industries-led discussion on the realities of poverty ended with plenty of questions on how to address the problem. But Goodwill of the Southern Alleghenies’s Kimberly Robertson hopes monthly “Coffee Talks” on the issue, like this one, will eventually grow into new, achievable solutions to tackle poverty locally. “There isn’t an easy answer to this problem,” said Robertson, the nonprofit’s planning and development director, while a small group in attendance mulled over eye-opening figures about the Johnstown area’s economic realities. 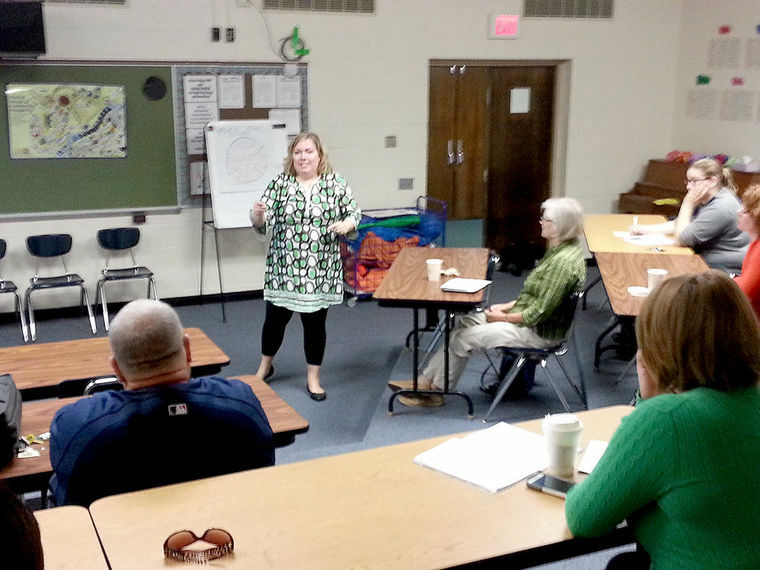 Kimberly Robertson of Goodwill of the Southern Alleghenies leads the first in a monthly series of “Coffee Talk” sessions at Greater Johnstown Career & Technology Center that will focus on the challenge of poverty. The median household income for a Cambria County family with at least one child is $25,000. The city’s unemployment rate is 9 percent – two points higher than the county and significantly higher than the 5.6 percent statewide average. Robertson and those in attendance said they realize there’s no easy answer. These days, it seems more and more people are struggling to make ends meet. And many people who are living in poverty and who rely on government benefits see little advantage to leaving that lifestyle because an $8- or $10-an-hour job might not cover the needs that were previously supplied to them, she said. That’s a mentality among those too young to work as well, noted one meeting attendee, Tony Penna Sr., a longtime coach and founder of the Coaches For Kids nonprofit. There are kids today growing up without seeing enough positive professional influences around them, he said. “People are struggling … they are trying to find a way to pay their bills and the stress builds up,” said Ritter, a court-appointed special advocate with Beginnings Inc.
Robertson said the system in place to address poverty often doesn’t offer the framework to help with the individual, and often complex, series of hurdles a family might have to overcome to pull themselves out of it. Often, a mix of financial assistance and finding ways to empower the impoverished to better their lives with less help from the government is the answer – but that doesn’t make it simple, she added. She hopes the monthly Coffee Talks series at Greater Johnstown Career & Technology Center – the next meeting , on Oct. 16, will focus on causes of poverty – will spur new dialogue into how groups like Goodwill and others can find Johnstown-specific solutions. Johnstown was built on the back of hard work, she noted. “If we can do steel and coal, we can solve this problem,” she said.